07 - 2018: Capband paper has been conditionally accepted to ACM SenSys 2018. 02 - 2018: TYTH paper is accepted to ACM MobiSys 2018. I’m a PhD. student at University of Colorado Boulder. 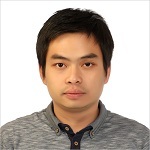 I am a PhD student in Mobile and Networked System Lab supervised by Prof. Tam Vu at the University of Colorado Boulder. ► I obtained my B.S from the University of Science in Ho Chi Minh City. ► I received the M.S degree in Computer Science and Entrepreneurship at the University of Nottingham. ► The following prizes have been awarded to my works: Best Paper Nominee (ACM SenSys 2017), Best Paper Award (ACM MobiCom-S3 2017-2018), 2nd prize (ACM MobiCom'17 App Contest). Stunning photos I took during my travells. (37 out of 138 submissions, acceptance ratio: 26.8%). This paper explores a new wearable system, called TYTH, that enables a novel form of human computer interaction based on the relative location and interaction between the user’s tongue and teeth. TYTH allows its user to interact with a computing system by tapping on their teeth. This form of interaction is analogous to using a finger to type on a keypad except that the tongue substitutes for the finger and the teeth for the keyboard. We study the neurological and anatomical structures of the tongue to design TYTH so that the obtrusiveness and social awkwardness caused by the wearable is minimized while maximizing its accuracy and sensing sensitivity. From behind the user’s ears, TYTH senses the brain signals and muscle signals that control tongue movement sent from the brain and captures the miniature skin surface deformation caused by tongue movement. We model the relationship between tongue movement and the signals recorded, from which a tongue localization technique and tongue-teeth tapping detection technique are derived. Through a prototyping implementation and an evaluation with 15 subjects, we show that TYTH can be used as a form of hands-free human computer interaction with 88.61% detection rate and promising adoption rate by users. (26 out of 151 submissions, acceptance ratio: 17.2%). Accurately measuring and monitoring patient's blood oxygen level plays a critical role in today's clinical diagnosis and healthcare practices. Existing techniques however either require a dedicated hardware or produce inaccurate measurements. To fill in this gap, we propose a phone-based oxygen level estimation system, called PhO2, using camera and flashlight functions that are readily available on today's off-the-shelf smart phones. Since phone's camera and flashlight are not made for this purpose, utilizing them for oxygen level estimation poses many challenges. We introduce a cost-effective add-on together with a set of algorithms for spatial and spectral optical signal modulation to amplify the optical signal of interest while minimizing noise. A light-based pressure detection algorithm and feedback mechanism are also proposed to mitigate the negative impacts of user's behavior during the measurement. We also derive a non-linear referencing model that allows PhO2 to estimate the oxygen level from color intensity ratios produced by smartphone's camera. An evaluation using a custom-built optical element on COTS smartphone with 6 subjects shows that PhO2 can estimate the oxygen saturation within 3.5% error rate comparing to FDA-approved gold standard pulse oximetry. A user study to gauge the reception of PhO2 shows that users are comfortable self-operating the device, and willing to carry the device when going out. Best Senior Design Project in College of Engineering at CU Denver in 2016. ► Best Paper Award Nominee, ACM SenSys 2017. ► 2nd prize at to ACM MobiCom'17 App Contest. ► Best Paper Award, ACM MobiCom-S3 (Oct. 2017). ► Awarded Excellent Oral Presentation at ISIPS 2015, Waseda University, Japan. ► Awarded Excellent Poster Presentation at ISIPS 2014, Waseda University, Japan. ► Funding recipient of Nationwide Brain Korea 21 Program for Leading Universities & Students (BK21 PLUS) to publish at least one SCI/SCIE scientific journal per year from 2013 to 2016. ► Recipient of the Information Technology Research Center (ITRC) Scholarship (from 2013~2016). ► Recipient of University of Nottingham Malaysia Campus 2010 Developing Solutions Masters Scholarship. ► Student’s science research contest – Mathematics and Computer Sciences: Winner (Final year 2008-2009). ► The adventure of finding solution – Mathematics and Computer Sciences: 2nd runner up (1st year 2005-2006). 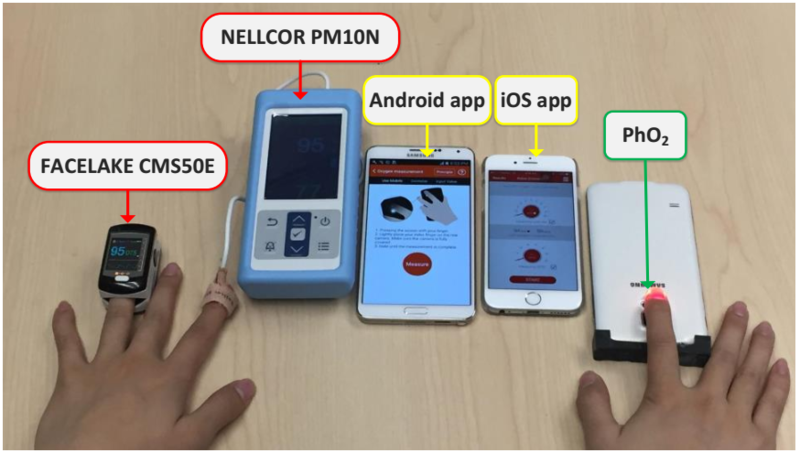 In this project, we propose a phone-based oxygen level estimation system using camera that are readily available on today’s off-the-shelf smart phones. Since phone’s camera is not made for this purpose, utilizing it for oxygen level estimation poses many challenges. We introduce a cost-effective add-on together with a set of algorithms for spatial and spectral optical signal modulation to amplify the optical signal of interest while minimizing noise. 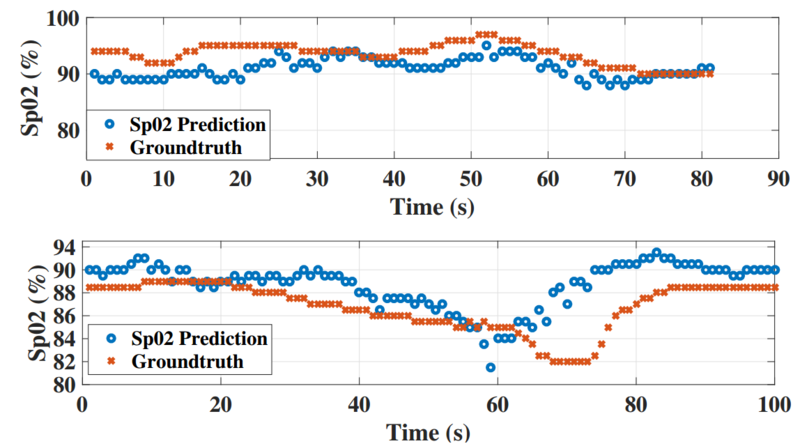 A light-based pressure detection algorithm and feedback mechanism are also proposed to mitigate the negative impacts of user’s behavior during the measurement. We also derive a non-linear referencing model that allows our system to estimate the oxygen level from color intensity ratios produced by smartphone’s camera. PhO2 and its general view for SpO2 measurement. (a) A person is placing his index finger on PhO2 add-on to check his SpO2 level. (b) A back view of PhO2 use in which the add-on covers the phone’s flashlight and back camera and a zoomed-in visualization of how PhO2 works. Ph02 hardware design (3D model - led, Prototype - right). Experiment setup to compare PhO2 with other 4 pulse oximeters. Fine-grained evaluation on prediction of oxygen level of 6 participants. Spring 2017: TA for CSCI-5446: Theory Of Automata. Instructor: Prof. Tom Altman.